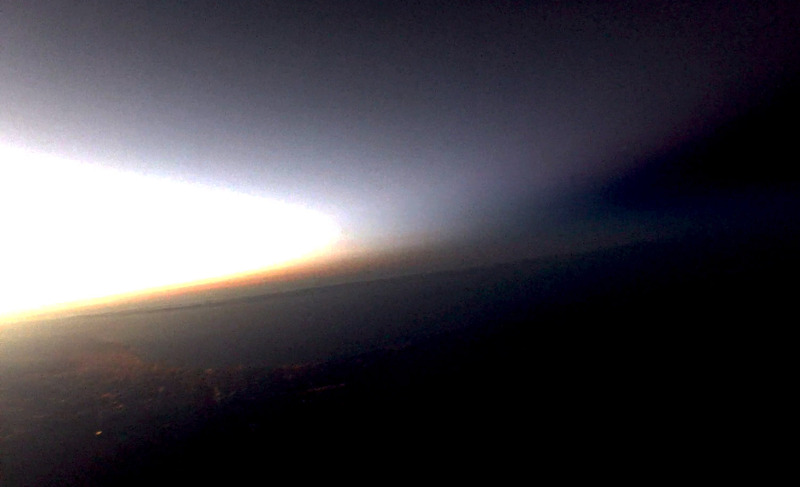 Last Sunday we participated with Far Horizons in a high altitude balloon launch. We set up at our usual airfield, Koerner Aviation. Launch time was set for 7:15pm, about half an hour before local sunset. Our goal was to get some good video of the Earth limb and the terminator shadow moving across the ground. Hopefully, the balloon would remain in sunlight while at altitude and would be visible from Chicago in the evening twilight as a -6 magnitude light moving about 10° above the southern horizon. 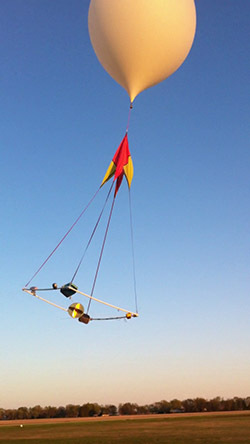 Additional experiments included a remote drone camera and a two-way communication system. Rather than the usual payload boxes, we used an image stabilization frame to support the cameras and GPS’s. The wider axis increases the moment of inertia and should give us less crazy spinning on the video. The launch was picture-perfect. The vehicle soared up into a clear, deeply blue sky. The ground winds were from the northeast, launching the balloon to the southwest before it turned to the southeast and then more due east in the upper level tropospheric winds. We were able to track it visually until it was past 25,000′. Dusk fell as we followed it east. Unfortuately, the balloon was not as visible as we had hoped. Our most likely guess is that we were too late in launching. Next time, I would try launching an hour before sunset. At over 82,630′, the balloon was drifting slowly to the west in the reverse winds of the stratosphere. The burst happened at over 96,670′. The descent through the stratosphere initially happened rapidly, coming down to 36,000′ in about 10 minutes. The actual flight path was very close to the predicted flight path, shifted north by a couple miles. Had it been light, we probably would’ve seen it come down. As it was, it landed in a fallow field not more than 100′ from the road. The strobes flashing in the darkness were obvious. As recoveries go, this one was amazingly easy. The image below is a frame from the video. It looks like the GoPro was having difficulty with the high contrast between the setting Sun and the ground in shadow. Nonetheless, if you look closely, you’ll see the glowing lights of Chicagoland twilight. The terminator is just to the right, cutting across Lake Michigan. The Earth’s shadow is projected in the atmosphere rising to the west.